The last game of Saturday night that you can bet on – sorry Charleston Southern at Hawaii – is this Pac-10 opener between Oregon and Arizona State. And, frankly, this doesn’t shape up to be much of a game if the Ducks keep up their ridiculous pace. Oregon has put up a silly 72, 48 and 69 points so far to lead the nation in scoring and total offense. And it has allowed just 13 points total in three games to lead the nation in scoring defense. But in fairness, the Ducks have played arguably the worst team in the FBS (New Mexico), a mediocre, rebuilding SEC team (Tennessee) and an FCS school (Portland State). The Oregon football schedule is comprised, obviously, of one of the easiest nonconference slates in the nation. The Arizona State football schedule opened with two FCS patsies in Portland State – that score was 54-9 if you want to compare to the Oregon 72-0 whitewashing of the Vikings – and Northern Arizona, before nearly pulling off a nice upset at Wisconsin last week. The Badgers survived thanks to a blocked extra point with just over four minutes left. This ought to be fun considering Oregon is averaging 1.05 points per minute. Of the three games in which a team has scored more than 65 points this season, Oregon has two. ASU’s defense leads the nation in three-and-outs possessions, averaging 3.75 per game. That unit forced 10 plays of negative or no gain for -14 yards in the loss against the Badgers. Oregon has done most of its damage on the ground, as it’s second in the nation in averaging 380.7 rushing yards per game. 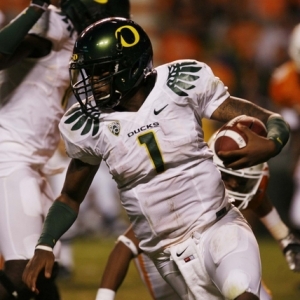 QB Darron Thomas has looked a lot like the departed Jeremiah Masoli, having passed for 562 yards (although just 53.4 percent completions) and eight touchdowns and having run for 84 yards on 15 carries. He has a 148.78 efficiency rating, albeit against a schedule ranked No. 126 nationally, compared to Masoli's 129.46 in 2009. RB LaMichael James has 361 yards rushing in just two games. Even with one fewer game than most backs in the Pac-10 (James was suspended the opener), James has 37 more rushing yards than any other player in the conference. Backup Kenjon Barner is averaging 7.4 yards per carry and has four TDs. James/Barner is the Mark Ingram/Trent Richardson combo of the West Coast. ASU quarterback Steven Threet, a transfer from Michigan, leads the Pac-10 in total offense (286 yards per game) and ranks 17th nationally. The Sun Devils have had two backs exceed 100 yards in games this year, with freshman Deantre Lewis having 122 last week against Wisconsin and Cameron Marshall with 104 in the season opener. No doubt they will try and run plenty to keep the Ducks offense off the field, even though the Devils play a spread up-tempo offense. The Ducks are currently 11.5-point favorites with a total of 57. Currently about 75 percent of the lean is on the reigning Pac-10 champs. The line has moved a point toward Oregon since its open at most books, while the total has gone up nearly three points as most books. Don’t rule out the heat playing a big role here, which could be a big advantage for the Sun Devils. Game-time temperatures are expected to be about 100 degrees. To prepare, the Ducks practiced indoors some this week with the thermostat turned up about as high as it would go. However, the Ducks have won five straight games against the Sun Devils, including the last three in Tempe, averaging nearly 42.6 points per game during that stretch. Oregon has won nine of the past 12 meetings overall. That’s enough for me. Take the Ducks and the ‘over’ – I’m shocked the total isn’t in the mid 60s although the heat could possibly wear the players down. Doc’s Sports went 3-1 for NFL picks last week including an easy 5-Unit winner behind Green Bay and we are very excited about this weekend’s picks (another 5-Unit winner is on the board. Our picks against the NFL Point Spread for this coming weekend are looking very fruitful. Call us toll-free at 1-866-238-6696 to find out about a free one-week football package from Doc’s Sports or any Advisory Board handicapper of your choice. Check our home page daily for NFL handicapping articles and up-to-the-minute updated odds.